Mossford Garage - a Memory of Barkingside. I started work at the age of 15 years as 'the boy', apprentice mechanic at Mossford garage. I remember going down the High Street to Pither's bakeries to get ham and cheese rolls, as well as pies for the mechanic's tea breaks. The woman that used to serve me would always pop an 'extra' roll in for me, with a wink of an eye, with a whisper,"That's for you!". I also glimpsed at the girls that used to work in Boots the chemist, a blonde and brunette. I remember the Westminster wine shop where my dad worked part time as a delivery driver and I helped on a weekend delivery until he got me the job next door in Mossford garage. My dad's full time job was as a fireman in Hainault. Mossford garage was a National petrol garage, which you don't see today, also a Ford agent. Bobby Moore did bring his Ford in for a service, also his wife's car. I also remember going to the other end of the High Street to Sainsbury's, a small shop, to get one of the mechanics a pie for lunch. Sainsbury's I think were just starting up. I think the Westminster Bank is still next door to where Mossford garage was. I was made redundant at Mossford garage in late 1969 when a supermarket was built on the garage premises. I did miss working at the garage, and still have fond memories of the place. 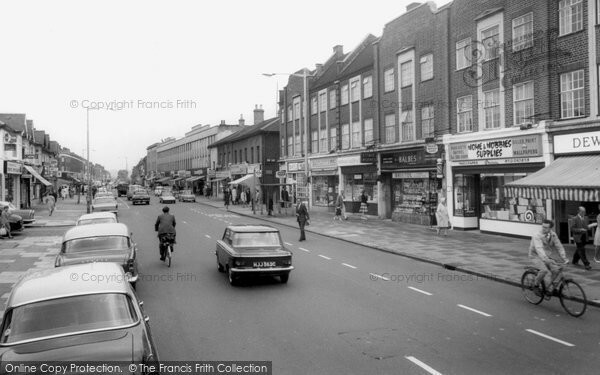 There were five mechanics working there, including the foreman and one greaser, or the 'grease monkey' as they called them!I remember Sheraton's the furniture store opposite and Curtess Shoes, which later moved down the High Street next to Pither's. My sister worked in Curtess Shoes. I attended the Fairlop School for boys at Fullwell Cross roundabout, as I was born in Barkingside. I have so much to say, shall continue another day. Thanks for reading. A memory shared by Glenn Savill on Apr 1st, 2010. Send Glenn Savill a message. I remember Mossford Garage. It closed down and Key Markets was built there. My sister used to work in Pithers the bakers on a Saturday. I also remember Sainsbury's was just along from the garage, they had big glass counters and when you'd got your shopping you went to the cashier to pay who was in a kiosk at the back of the shop. I remember Curtess the shoe shop and next door there was a posh dress shop that used to show their prices in guineas. There was also Bartons the bakers and Eastwells the green grocers. Further down the high street were two of my favourite shops as a kid Marments the toy shop and Rossi's ice cream parlour. I went to Fairlop Girls School with my two sisters and my brother went to Fairlop Boys. My mum was pregnant with me when they moved into Tomswood Hill and I lived in the same house there until 2006 so I've seen lots of changes around Barkingside and Hainault.